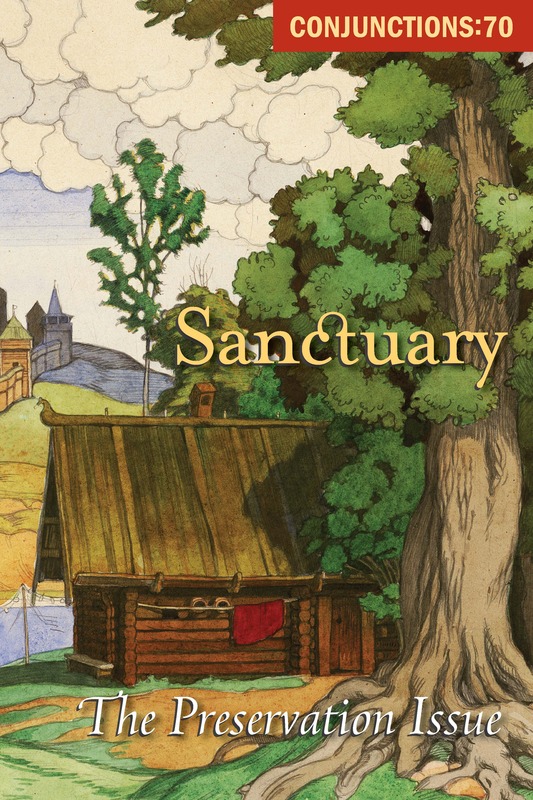 Conjunctions:70, Sanctuary: The Preservation Issue explores the myriad ways in which we go about preserving what might otherwise be forfeited. Whether trained specialists or lay people who care about something, preservationists come from every stratum of life. The archivist, the linguist, the local town historian. The paleontologist, the heirloom seed-saver, the family photographer, the Monument Men. Old two-by-two Noah and taxonomist Linnaeus. The suburban girl who collects enough yard sale books to build up a library and thereby safeguards that most fragile of things—knowledge. All can be preservationists. Cover art by Ivan Bilibin (Askold's Grave by Vertovsky A.N. scenery design; "Coast of the Dnieper"). © Federal State Budget Institution of Culture, A. A. Bakhrushin State Central Theatre Museum, Moscow.